Payano (E.H Herzruf x E.H Arogno) was born in 1994 and Terhi fell in love with him when he was a 3 year old Trakehner stallion. Even though he was not graded Terhi believed in his potential and brought him to Jürgen Bockmann stables where she was undergoing her own training. In subsequent years they formed a partnership which helped Terhi achieve her Golden Riding Badge in Finland. They also participated in the World Championships for young horses in 2000. 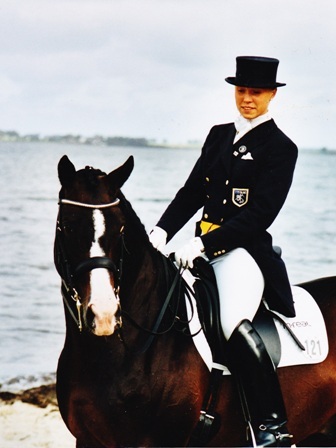 In 2001 they were placed at Prix St Georges level and returned again in 2002 to win further competitions at Intermediate I level before moving onto Grand Prix level in 2003. The peak of his career was in 2004 and 2005 with two gold medals at the Finnish National Dressage Championships and a number of placings at Grand Prix CDI*** level. In his career Payano has either won or been placed in over 50 competitions ranging from Prix St Georges to International Grand Prix. Unfortunatel he was injured in 2006 and was unable to continue competing. 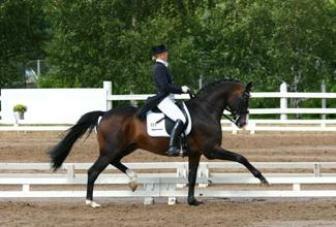 Since then he has been a breeding stallion and has sired several premium foals in Germany and Finland. At the age of 18 he had to be put down due to old age. Terhi praises especially the character and motivation of the horse: "For me he was one of the best horses I have ever had. He will always have a special place in my heart and I thank him very much. He showed me the true beauty of friendship between man and horse. "